ALL Application Fees – This includes door prizes if you are required to give one, juror fees if it is a juried show, and even the cost of the ticket to get your “helper” in for the day. Table / Space / Booth Fees – Make sure not only to include the fee for your space, but also the additional space costs. I have gone to many show where there is a flat $45 fee, but if you want power when you get there, it’s an additional $10. Also include the costs of any rented displays you might need here. Vendor’s License – I don’t know what the laws are in your state, but in my state, if you sell at a craft show, you are required to have a vendor’s license. Some states charge for this, some do not. ALL Travel Expenses – Not only does this include gasoline, but this also would include parking fees, airfare, taxi’s, truck/car rental, etc. Lodging – If you had to stay somewhere over night to get to your show, then be sure to include those costs as well. Food – Include anything you might need to eat, even if you are packing a lunch. Don’t forget to include any “snacks” that you might need in your travel to and from the craft show…you know that $1 sundae at McDonald’s needs added too. Other – This is mostly just a “slush” category for anything that doesn’t fit above. This also might include the cost of purchasing one or two things from another vendor. It is very important that you estimate your total. Once you have your total, you know what figure you have to CLEAR in sales before you begin to turn a profit. This will allow you to better understand if those kinds of sales are possible and if you want to give up your day, time, weekend to do it. In this example I would have to CLEAR $130 in sales before I began to make any money. Here’s the hard part. If you’ve sold at craft shows before, this will be easy for you. If you have not, then this will be more of an “educated guess.” At an average show that I do, I sell $200 in merchandise. This being said, if my craft show fees (as shown in the above example) are $130, by using the formula above, I will see a profit of $70. Now here’s the hard part. Let’s say that example was for a show that ran Friday, Saturday, & Sunday. I could estimate that by the time I lose (3 days of non-production and face-to-face sales) I can make more money by investing the time into 5 new quality pieces for my online store in those three days. However, I could also decide that the small profit margin is worth it to help spread my name and get my product in front of people. Again, only you can make these kinds of decisions … but I do ask that you think about them! Thanks for joining me today. Join me in two weeks to Build Your Brand & experience success. Previous post: Friesen Friday: Owl Mania! The description of the financial cost is spot on. I think the one thing that all small craft businesses must evaluate is customer interaction and image control. Some craft shows you are just one of hundreds trying to do the same thing. Others you are unique among hundreds. Depending on your product either of these venues can benefit you or cost you. Standing out among a collection of peers can bring in a lot of traffic after the show or being just another ??? vendor might not bring in the after show sales. Being the sole ??? vendor might highlight your product or maybe the show’s audience is not suited to it. Looking at the straight $’s is a simplistic way to evaluate whether a show is “worth” doing. Sometimes you have to look at the intangibles along WITH the cost to see if you should do a show. There are shows I won’t do because of this fact while others I can’t wait to do again. Morning Katie! A terrific read, as always. I agree with the economic breakdown, completely. And I also agree that there are times when certain shows will result in a large outlay of cash and time – in order to pay off later with branding and sales to a key and targeted market. True, they don’t tend to be craft shows. But wedding shows can be great – and tricky – for a small business to get into. So are trade shows, such as the Fancy Food show for businesses in the food arena. We spent a gob – and I do mean a gob (like $1,000+) – to show at a heavily curated wedding show here in Chicago. I was SOOOOOO nervous to spend that kind of money. Especially because we didn’t sell a single thing that day. But we connected with dozens of event coordinators, and have since made our money back with follow-up orders. What great insight Patricia! Thank you for sharing. I do not do BIG shows, just small ones in my area. I’m glad to hear your big shows are successful! That’s so awesome. Good for you! Precisely why I don’t do craft shows. 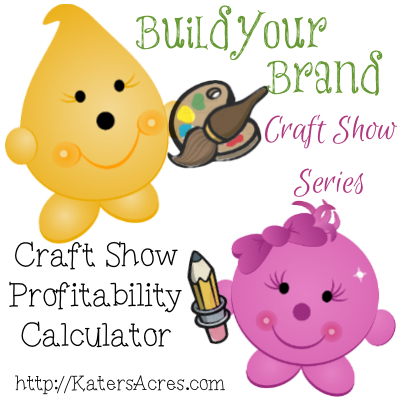 And also, the profits after your craft show expenses aren’t really your profits…they’re your “adjusted gross sales”. You still have to take into consideration all the other expenses you have for any sales venue, such as materials, overhead, and paying yourself. Looked at it that way, plus the lost productivity, craft shows cost a lot of money. Ginger – I agree with this and only do ONE a year any more.